I recently received a sample of some really beautiful looking black barley. 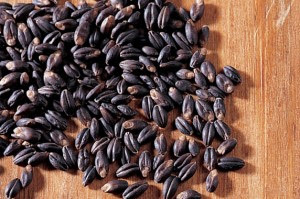 Black barley was originally cultivated in Ethiopia. As I understand it is a very rare strain of barley and has only been grown in the US for a short time. This is not pearled barley, which I usually buy. Pearling makes the grain cook up faster and the texture is softer and more rice-like. That happens by removing the very nutritious bran layer of the grain. Whole barley in contrast is quite chewy in texture because it does contains all of the bran. Like many whole grains I cook at home I don't always have a recipe in mind when I bring home these items but I know that they are super versatile. Sometimes sweet, sometimes savory, breakfast, lunch or dinner. Whole grains can easily become a part of any meal.